When my family and I decided to see Ralph Breaks the Internet on Thanksgiving, I was excited. I really liked Wreck-It Ralph for being a love letter to old-school gaming while also having a heartwarming story of friendship, selflessness, and learning to accept with grace that which you can’t change. Oh, and just a warning, I’m gonna be spoiling some major plot details — no, really, I am, right up to and including the ending. So if you don’t want to know anything before you hit the theaters this weekend, for the love of Walt, stop now. Set six years after the first film, Wreck-It Ralph (John C. Reilly) and Vanellope of Sugar Rush (Sarah Silverman) have settled into a comfortable, if dull existence. An act of friendship from Ralph inadvertently results in an arcade-goer breaking the wheel of Sugar Rush’s arcade cabinet. Proprietor Mr. Litwak is open to purchasing a replacement wheel his youthful clients find on eBay, but he says the price ($200) is more than the cabinet earns in a year. He says he’ll have the game unplugged and hauled away for scrap at the end of the week. Ralph and Vanellope, wanting to fix the situation and ensure her fellow game characters don’t end up homeless, travel to the internet via Litwak’s newly-purchased router in the hopes of somehow getting the wheel themselves. Trouble is, they know nothing about the internet and thus, hijinks ensue. Anyway, a chance trip into an MMO open-world driving game called Slaughter Race — think Twisted Metal meets GTA — run by the cool and wise Shank (Gal Gadot) has the jaded Vanellope questioning whether she wants to return to her home game. Meanwhile, Ralph somehow manages to stumble into viral video stardom, and embraces it in the hopes of earning enough money to buy the wheel. When Ralph is confronted with the possibility that his best friend might not come home even if they get the wheel, he’s not pleased. He hits both figurative and literal rock bottom during a trip to the “Dark Net,” and things kinda spiral out of control from there. Let me be clear: there’s a lot to like about this movie. The voice acting is superb, with the standout being Alan Tudyk as Knowsmore, a sort of AskJeeves parody. The interval with the Disney Princesses you saw in the trailers — which occurs when Vanellope finds herself on the Oh My Disney website — is more than a little self-satisfied, but does contain the most genuinely funny moments in the film and ends up paying off in awesome, if unexpected fashion. And Fix-It Felix (Jack McBrayer) and Calhoun (Jane Lynch) steal the show during their five minutes of screentime. The design of the Internet — here imagined as a vast, sprawling city with different buildings devoted to what we see as websites — is breathtakingly beautiful. Yeah, the product placement is obscene, but there’s a hint of self-effacement in each of the brands’ spotlight moments — eBay, for example, is a vast auction hall filled with useless curiosities that people pay top dollar for. Ironically, the scene which best exemplifies the weakness of Ralph Breaks the Internet is one that’s not actually in it. 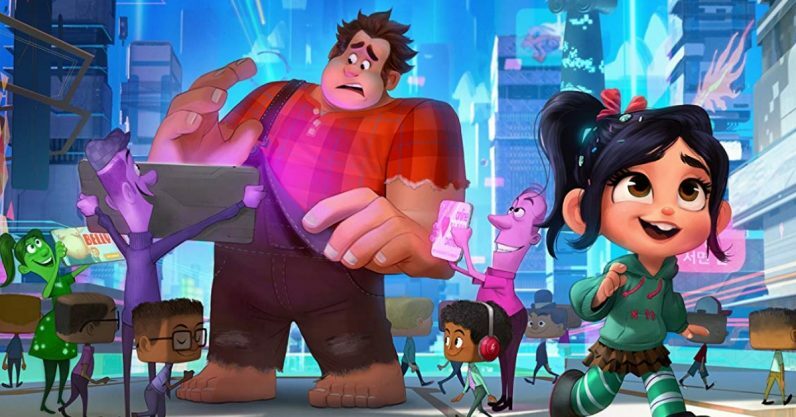 In one of the trailers, Ralph and Vanellope argue with personified algorithm Yesss (Taraji P. Henson) over the title of their own movie, positing it should be “Ralph Wrecks the Internet.” She counters that “breaking the internet” is a thing. When they point out their suggestion sounds better and makes more sense, she concedes their point… but the title remains the same. That’s kind of the movie in a nutshell: it forgoes what would be logically and thematically appropriate for its universe in favor of chasing Internet “things” that were old before the first teaser posters came out. It’s a collection of tired visual gags and riffs on patterns in digital life that never quite coalesces into a cohesive plot. For all the movie tries to be about the internet, it doesn’t have much to say about it. There are moments where it comes very close to making a critical remark. But in the end, it doesn’t have any profound statement to make on modern life and whether the internet is a force for good or evil. It’s just kinda there. For example, there’s a brief moment in the movie when Ralph wanders into a literal Comments Section and is reduced to tears by the nasty words of thousands of people talking about his viral videos. Yesss tries to tell him the first rule of the internet is never to read the comments section, and I assumed this was opening up the floor for Ralph to make an insightful comment akin to, “Why is it on me to ignore it? Why do people think this is okay to do?” But that doesn’t happen, and it feels like a missed opportunity (not to mention a waste of time). In fact, now that I think about it, the movie probably inadvertently suggests Ralph humiliating himself for online stardom is a really good thing, given that he raises over $30,000 in ad revenue on his videos within about 16 hours. Yeah, try explaining to kids they shouldn’t do whatever the next version of the “In My Feelings” challenge is when a Disney film told them you could make easy money by chasing viral video trends. The actual core of the film is about Ralph and Vanellope’s friendship, and how it’s teetering on a crossroads as she plans a move out of the arcade. Their friendship was the backbone of the first movie, so it shouldn’t have been very difficult to make it mean something here. Unfortunately, it’s undercut by both of their motives being massively unhealthy. First, Vanellope wants to pick up and move to Slaughter Race, despite the first film’s entire plot hinging on what a bad idea it is to game-jump. Her justification is “No one will even miss me,” despite the film beginning with two young gamers talking about how much they love her. If she’s not in the game, then, new wheel or not, won’t the players assume the game is broken regardless, meaning Litwak will still unplug it? You may say that sounds like nitpicking, except that’s exactly what Ralph did in the first movie, and the fact he came very close to leaving all his fellow characters homeless by making the game look broken was treated as a very grave betrayal. Second, Ralph regresses in this movie into his old insecure self and practically hyperventilates at the thought that he and Vanellope will no longer be attached at the hip. He instantly dislikes Shank because she captures Vanellope’s attention, and becomes so jealous and upset at their budding connection he sets a virus on Slaughter Race in the hopes it’ll “slow things down” so Vanellope will become bored and come back to him. Now let’s break this down a little bit. This is a digital world, but everything we’ve seen thus far is at least somewhat analogous to us in the regular world. Given how serious the virus is when it’s properly unleashed, this is basically the equivalent of a possessive guy unleashing smallpox on a city in the hopes it’ll give his friend’s new girlcrush the sniffles. And Ralph’s supposed to be the guy we’re rooting for? I’m not saying a hero can never make a mistake. But there are mistakes, and then there are actions so reprehensible I find myself hoping Vanellope doesn’t forgive him. The virus escapes its containment and copies Ralph’s “insecurities”, which are so extreme it leads to a World-War-Z-esque Megazord Virus Ralph DDOS-ing every major site on the internet. Defective code as a metaphor for human flaws? It’s not that it’s a bad metaphor — it’s just that, like everything else the movie is trying to tell us, it’s “newborn foal” levels of clumsy. Everything else about the film is meant to tell kids that it’s okay if your friends don’t always share your dreams, and sometimes leave to pursue new opportunities. Trust me, I get it — the film is not subtle about delivering its message. It’s just that the plot holes and character inconsistencies undercut these positive messages by making the their actions look painfully unhealthy, destructive, and toxic.